Paul Hendy’s Christmas pantomimes have become something of a Sheffield institution, with Peter Pan marking his 12th consecutive production for the Lyceum. There’s something comfortingly familiar about a Hendy production. No matter what the story, certain elements are always in place: running jokes and catchphrases, a soap star or two, a couple of kids TV presenters and panto legend Damian Williams in a starring role. 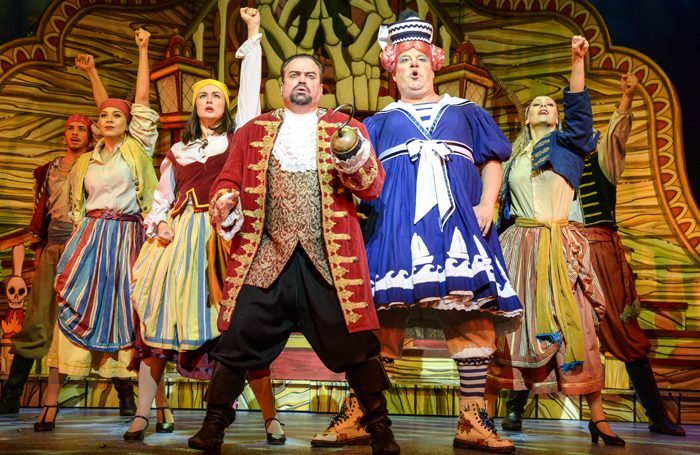 As ever, Williams’ comic timing and ad lib skills are second to none, and while he’s the obvious star, he never outshines the rest of the cast: Shaun Williamson soaks up the jeers and boos as Captain Hook, while David Ribi and Samantha Dorrance make for a sweet and charming Peter Pan and Wendy. There’s even room for Nana the Dog, here recast as an enormous break-dancing canine. Yet it’s all about the spectacle with Hendy’s productions, and Peter Pan may be his most ambitious yet. Ribi makes his entrance by flying on to the stage and there are breathtaking dance routines from the Diamond Acrobats and fire eating. It’s a genuinely funny evening, with Williams bouncing off Williamson beautifully in a comedy routine involving ridiculous puns on fruit and vegetables being a particular highlight. Hendy’s productions stick to a reliably delightful formula, but always throw in a few surprises for good measure. As Damian Williams says: where else would you see Barry from EastEnders singing a Taylor Swift song? Sheffield Lyceum, that’s where.